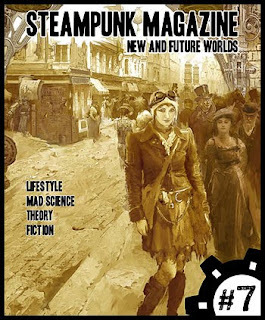 Have you downloaded Issue 7 of Steampunk Magazine yet? No? Go check it out! Besides my poem Alice's Tumble, it also contains some fascinating stories, interviews with steampunk bands The Men Who Will Not Be Blamed For Nothing and Sunday Driver, and many fantastic articles, my favorite being the one on the future of steampunk fashion. The magazine is available for free download, and can also be purchased for eReaders or for real life. While you're over there, also check out my latest blog post, More on the "Punk" in Steampunk.